After performing well for a number of seasons for a Tyrrell team in bad decline, Brundle ended up at Zakspeed- where he recorded the team’s only points finish. Fed up racing for back of the grid teams, Brundle decided to focus on sportscar racing for 1988, performing duties as a Williams tester until Nigel Mansel suffered a nasty bout of chicken-pox and he got called up. Brundle was unable to fill the role for the following event at Monza, officially due to sportscar commitments with TWR, although there is a suspicion neither Mansell, nor Brundle wanted to suffer driving the Judd engine down those Monza straights. Mansell officially recovered to compete in the final races whilst Brundle signed with Brabham for 1989, and went on to drive for Benetton, Ligier, McLaren and Jordan. “In 1988 I was their test driver. I think it was when they were testing these twin disc brakes on the active car and it spat Nigel off the road too many times. He was more or less saying “put a monkey in it, I’m not driving it any more” so I was that monkey. But it was a really good experience. I’d be testing at Monza and twice a day it would just flop on the ground when the active gave in. Nigel got chicken pox, and at the very last moment on the Thursday, I was told to go over to spa. We cut a deal that included all expenses and the whole year’s testing that I’d done for them risking my life in that bloody thing. I asked Frank for an amount of money that was not much more than I get paid for an after-dinner speech now, and I swear if he could have, I thought he was going to get up out of his wheelchair and hit me! He had such a good way of putting shock on his face. And the audacity of me asking for such a number! And the numbers were stupid- as in, very low. I jumped into Nigel’s seat which was a very comfortable rubbery thing, I tried to drive it out of the garage and I couldn’t turn the wheel because it had Nigel’s little doughnut of a steering wheel on it. I was quickest in the wet (second qualifying) and finished up seventh in the end because two cars were disqualified for some reason. Williams dominated the 1986/87 seasons, but for 1988, they lost their Honda engines and subsequently slipped back to 7th in the standings with Judd engines. Despite having a contract with Honda for 1988, Williams refused to dump Nigel Mansell in favour of Satoru Nakajima at Honda’s request. It is alleged that Honda were unhappy that Williams had not honoured Piquet’s number one status and had lost the 1986 championship as a result. Furthermore, Honda had fallen in love with Senna and agreed to supply a second team- Lotus with their engines for 1987, whom Williams duly trounced- which alienated Honda even further. That left Williams with Judd power for ’88 which was described by both drivers as being “pathetically slow” in a straight line. Honda offered 1000bhp, the Judd engine a scant 600bhp. The FW12 was nothing special either, as the team were struggling to get the active ride working and focussed their energies on that. The heat and vibrations caused by the Judd engine impacted negatively on the system as air started getting into the hydraulics leading to unpredictable handling from corner to corner. 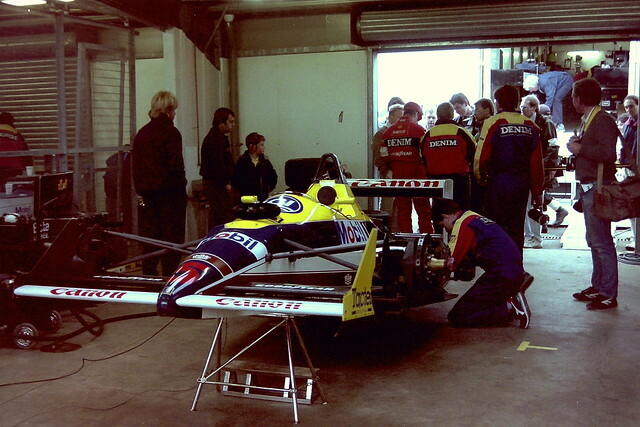 The team decided to take it off the car for the second half of the year- which was greeted as a positive move by both Mansell and Patrese, and draws quite an interesting parallel with the FW35 and the coander exhaust system. This was the first season since 1978 that Williams failed to win a race. Still, IMO the car was gorgeous. 12th on the grid doesn’t sound great, but those Marches were clearly superior in the race compared to the Williamses of both Brundle and Patrese- and indeed, they proved a threat the whole season, beating Williams to 6th place in the CC. So Brundle got up to speed pretty well, all told. To jump in a car in the middle of the season with no concept of it’s grip levels, and to be fastest the following day was superb. for several laps, Brundle fought wheel-to-wheel alongside Ivan Capelli who went on to finish 3rd. Capelli was in form during that part of the season, and the Marches enjoyed a clear superiority over Williams. Still, Brundle looked combative and racy, and held both back for some time. Good grit. He was clearly outpaced by Patrese in the dry all weekend. In the race he found himself 17 seconds down after 25 laps. Brundle himself explained that he probably wasn’t fit enough to drive the car in the dry. I would have loved to see Martin Brundle given more time at Williams, although whether he would have won any races for Williams in 1989, I’m not sure. Just like Schlesser, he had a hand in developing the active ride during 1988, so his contribution to Williams goes beyond this race in isolation- he literally risked his neck to help the team sort out an innovative technology. Going fastest in a wet qualifying session on Williams debut was electric. A pity this wasn’t done under 1996+ regs, otherwise, that would have won him Pole on debut ahead of Senna’s McLaren Honda, and with a Judd engine too! 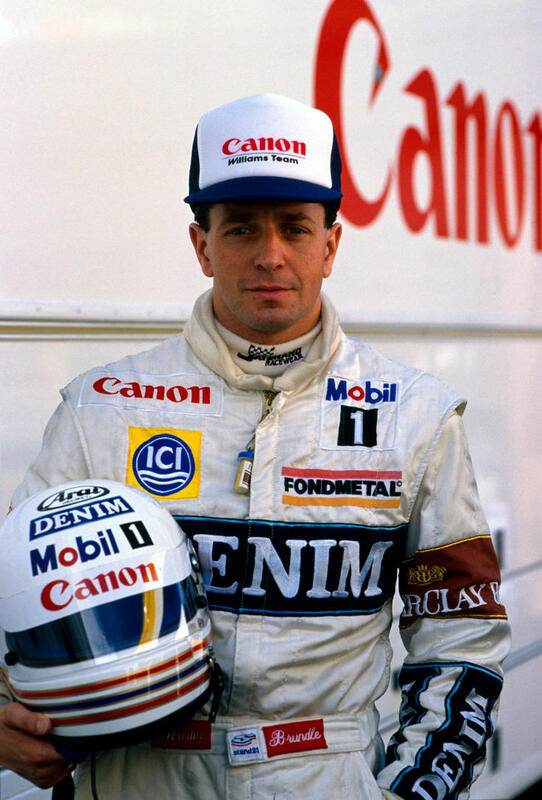 In the dry, he was fairly average, roughly 1 second a lap behind Patrese, in part, due to a lack of fitness, but he raced hard wheel-to-wheel, and he stayed the course driving at a pretty decent level in an underpowered car. It’s nice to be able to include him as a Williams driver.